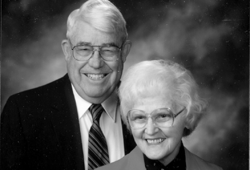 You might have called them Golden Eagles, because they had not only passed that 50th year together but also of graduation from then Ashland College when they completed their estate plan that included their alma mater. Both children, David (66) and Anne (70) also graduated from Ashland, which is so much a part of their familys life. One could not find more enthusiastic supporters of Ashland University and its mission to students. Prior to Johns death several years ago, after already setting up an endowed scholarship program, the Crumrines discovered how they might create an estate tax free family plan. In doing so, they also provided for numerous charities by establishing a charitable remainder trust as one of their legacies. But they were not yet done! When a commercial annuity matured, with assistance from the Legacy Estate Programs Office, they were able to add a charitable gift annuity to their portfolio, with little cost to their estate and a significant boost to their cash flow from this asset. Thanks to John and Ruth for asking us questions about their estate planning questions but also on how to most effectively handle this maturing commercial insurance annuity. © Copyright 2014. Ashland University. An Equal Opportunity/Equal Access Institution.